economy and ensuring affordable warmth to our customers. 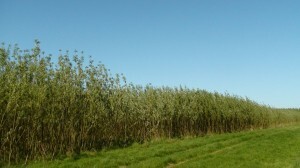 Biomass District Heating has significant environmental, economic and social benefits and is supported by government policy at all levels. 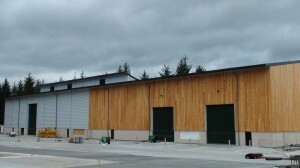 Officially opening in 2012, the Biomass Energy Centre comprises an energy plant-room and woodfuel store. The plant room consists of two biomass boilers, 700kw and 900kW, two thermal stores each with a capacity of 50,000 litres. This provides the base load heating requirements for the development as well as flexibility in meeting variable loads. The thermal stores ensure operational efficiency. 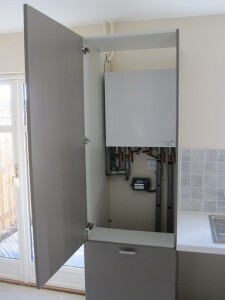 Two gas boilers provide back-up and peak load heat requirements. Woodchips are weighed and delivered into the Woodstore. From there, they are loaded into the Woodfuel Silo, which has a walking floor that feeds the biomass boilers. Around 6km of underground pipes distribute hot water from the Energy Centre to the individual buildings connected to the district heating scheme. 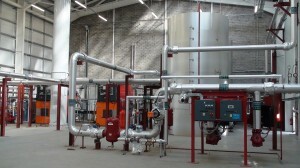 The main district heating pipes are constructed from steel and include an alarm leak- detection system. They are highly insulated with a very low thermal loss over long distances ensuring no heat is wasted. Service pipes connect from the mains to individual buildings and are constructed from flexible plastic. The temperature of the water leaving the Energy Centre is 80°C flow and returns at 60°C. 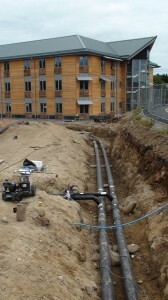 Heat is transferred from the incoming district heating pipework to the internal heating system of the building via a heat exchanger contained in a Hydraulic Interface Unit (HIU). The District Heating Scheme is a closed loop system meaning no hot water is directly transferred into the internal heating system pipework. 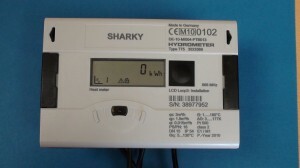 Only the heat is transferred, which is measured by a heat meter in kWh. There is no change to the internal heating system design. The HIU is approximately the same size as a conventional gas boiler. Copyright © Hill of Banchory ESCo Ltd 2013. All rights reserved.